Vasant Kusumakar Ras is an ayurvedic herbal mineral medicine used as anti-hyperglycaemic, aphrodisiac and cardioprotective agent. It is famous for diabetes mellitus in which it is effective for normalizing and stabilizing the blood glucose level. In addition to diabetes, Vasant Kusumakar Ras is recommendable for men’s problems, urinary disorders, nervous disorders, and in geriatric diseases. Haldi (Turmeric – Curcuma Longa) Q.S. Ikshu (Ganna – Sugarcane) – Saccharum Officinarum Q.S. Banana Tree Leaves – Musa Paradisiaca Q.S. Kamal (Lotus) – Nelumbium Speciosum Q.S. Chameli (Malati or Royal Jasmine) – Jasminum Grandiflorum Q.S. Vasant Kusumakar Ras has following healing properties. Vasant Kusumakar Ras is helpful in following health conditions. However, dosage of Vasant Kusumakar Ras 50 mg per kg body weight is not used in clinical medicine. The maximum suggestible dosage 250 mg twice daily or 500 mg per day in adults having optimum weight according to his height and age. Still we understand that Vasant Kusumakar Ras or similar herbal mineral preparation containing mercury, lead etc. should be used with caution and only for limited period (likely less than 4 weeks). Vasant Kusumakar Ras provides nourishment and strength to organs like pancreas, heart, testes, ovaries, brain, reproductive organs, and lungs. Generally, it is ayurvedic supplement for these organs. However, nowadays, it becomes famous for diabetes due to its potent anti-hyperglycemic effect. It lowers blood glucose level without causing hypoglycaemia. Studies have shown that Vasant Kusumakar Ras has significant anti-diabetic and anti- hyperglycemic properties, so it is beneficial for diabetes mellitus type 1 and diabetes mellitus type 2. However, it does not lead to low blood glucose level (hypoglycemia) like modern anti-diabetic drugs or insulin. Vasant Kusumakar Ras due to Chandi Bhasma and other ingredients is beneficial in preventing and treating diabetic neuropathy. However, diabetic neuropathy requires long-term administration of medicines, so Vasant Kusumakar Ras cannot be used more than 4 weeks due to metallic formulation. A short course with Vasant Kusumakar Ras can be given for 4 weeks. In such cases, it should be given with Ashtavargam Kashayam, or Asanadi Kashayam. After 4 weeks, Kashayam and other anti-diabetic medicines should be continued. If patient has burning sensation in his feet, then Vasant Kusumakar Ras should be given with Guluchyadi Kashayam, or Balaguluchyadi Kashayam and Nimbadi Kashayam. Giloy Satva, Kaishore Guggulu, Amritadi Guggulu are also beneficial. Vasant Kusumakar Ras is also helpful in diabetic carbuncles. In this case, it is used for restoring weakness and controlling high blood glucose levels. Chandi Bhasma in it also speeds up the recovery process and reduces inflammation, redness, and prevents infections. However, Tapyadi Loh is a drug of choice for diabetic carbuncles, but Vasant Kusumakar Ras indirectly helps curing the condition. Other beneficial remedies are Daruhaldi (Berberis Aristata), Mahatiktam Kashayam, and Nimbadi Kashayam. In general, Vasant Kusumakar Ras is not used for gaining weight. It is only recommendable when weight loss occurs unintentionally due to diabetes. It provides strength to the body and muscles and it does not increase fatness in the body. For increasing physical strength, it should be used along with Ashwagandha powder in VATA cases and with Shatavari and Mulethi (Yashtimadhu) in PITTA cases. The best adjuvant for gaining weight and strength is cow’s milk. The general dosage of Vasant Kusumakar Ras is as follows. The dosage of Vasant Kusumakar Ras should be adjusted according to body weight. In diabetes, an adult person having 60 Kg body weight should receive 125 to 150 mg or one tablet of Vasant Kusumakar Ras two times a day. The dosage can be calculated on basis of 2 mg/kg body weight, but the maximum dosage of Vasant Kusumakar Ras should never exceed 250 mg twice daily or 500 mg per day. The safety profile of Vasant Kusumakar Ras has not been fully investigated. The study on Albino Wistar rats suggested it could be toxic in dosage higher dosage (i.e. 50mg/kg body weight). It is discussed in detail in Scientific Research Section Above. Generally, the short-term use of Vasant Kusumakar Ras does not cause any side effects and no abnormal symptoms appear after its consumption. However, it is a heavy metal formulation, which should be used under supervision of ayurvedic physician. Heavy metal toxicity may occur due to Vasant Kusumakar Ras if used in dosage higher than 500 mg per day and on long-term basis. Vasant Kusumakar Ras is not indicated in pregnancy and lactation. The heavy metal content may cause abnormalities in developing foetus or results in complications. Nourishing mothers should also avoid Vasant Kusumakar Ras because it may secrete into breast milk and heavy metal content in it may adversely affect the child. Kidneys of infants are immature to tolerate mercury accumulation in them and may develop autoimmune response and damage kidney cells. Research study suggested that however, Vasant Kusumakar Ras might improve kidney functions biochemically, but it has toxic effects histopathological. Heavy metal content in Vasant Kusumakar Ras may induce Apoptosis (cell death) in kidney tissues. Therefore, people suffering with any kidney diseases should not take it. How long can I use Vasant Kusumakar Ras? There is no treatment duration specified for Vasant Kusumakar Ras, but one should use it maximum for three months for precautionary purposes. A gap of minimum 2 weeks should be kept between two courses with Vasant Kusumakar Ras. In gap period, alternative medicines should be used according to the disease. What are side effects if Vasant Kusumakar Ras is taken for a year continuously? Research study discussed above under heading of Scientific Research in this article suggest that 50 mg per Kg body weight may lead to mercury accumulation in the kidneys, which may lead to renal diseases. However, 50 mg per Kg body weight is not the clinical dosage. It is very high dosage and may not safe for human. Many people use Vasant Kusumakar Ras for several months without any problem, but one should not use it more than 3 months continuously for precautionary purposes. 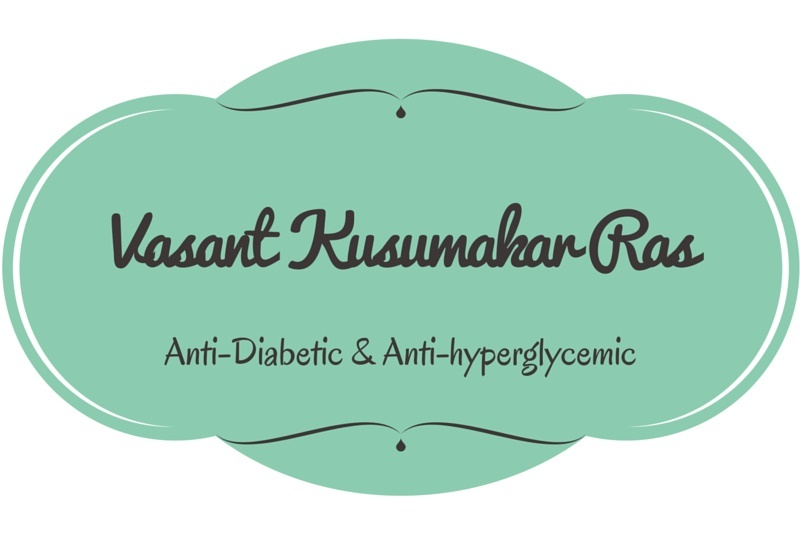 Does Vasant Kusumakar Ras cure diabetes? Vasant Kusumakar Ras is likely to help managing diabetes mellitus and controlling blood sugar level. It does not likely to cure diabetes. Can Vasant Kusumakar Ras cause constipation, irritation, and rise in B/P or heart rate? A well-prepared Vasant Kusumakar Ras does not cause constipation and irritation. It does also not increase blood pressure and heart rate. If any patient experiences these things, then it is necessary to rule out the other causes. Many ingredients in it give strength to the intestines and actually aid in reducing chronic constipation. You may have doubt about Ras Sindoor present in it, which may cause an increase in blood pressure and heart rate, but the amount of Ras Sindoor in Vasant Kusumakar Ras is very insignificant to cause these side effects. Secondly, it also contains other ingredients like Mukta Pishti, Praval Pishti, Swarna Bhasma, Chandan, lotus etc., which make it balanced preparation, so it does not likely to affect heart rate and blood pressure negatively. Can a normal man take Vasant Kusumakar Ras as an immune strengthening medicine? Vasant Kusumakar Ras is not only for diabetes, it is also beneficial in other health conditions. Many people also use it for improving stamina, strength, and vigor. Healthy individuals can take it for similar purposes. Yes, some ingredients in it also have immunity enhancer action, so it can be taken for this purpose as well. Shall this cause any harm if a normal man takes this for a month? If it is used for a month by a healthy individual, it is not going to cause any harmful effects. Can this be taken by a person having hypothyroidism? Yes, people with hypothyroidism can also take it without any issue. Dr. Jagdev Singh (B.A.M.S., M. Sc. in Medicinal Plants) is a Licensed Ayurvedic Practitioner under Central Council of Indian Medicine (CCIM) Act India and Board of Ayurvedic and Unani Medicine, Chandigarh since 2010. He is running his ‘Ayurveda Clinic’ in Rupnagar, Punjab, India. He has successfully treated thousands of patients with Ayurvedic Medicine and Ayurvedic Diet. Ayur Times is an initiative of his efforts to bring quality information on Indian Medicine with the highest level of relevancy and scientific evidence. Can you please suggest a suitable treatment for oral lichen planus? I trust this site among all. So out of curiosity put this question and plus I have come across some patients suffering from same, but I am not very confident in counselling them regarding recovery of lichen planus with ayurvedic medicines. The symptoms of oral lichen planus can usually be managed with ayurvedic medicine. Chirayata extract along with Jasad Bhasma is the best medicine for it. It provides significant relief within a few days in most cases. Other medicines include Mulethi, Swarna Makshik Bhasma, Mukta Pishti, Praval Pishti, Mukta Shukti Pishti, and Kamdudha Ras. Sir can vasant kusumakar ras be taken with milk? Yes, vasant Kusumakat Ras can be taken with milk. Sir, my father is diabetic. Have started using vasanthkusimakaram, but he started having hallucinations and spike in blood sugar levels. Is this due to some initial way for the body to get used to the mineral ingredieñts or side affects. Please advise if i can continue using or stop. How Is Mozzarella Cheese Made? Disclaimer: Information provided on this website is not intended to diagnose, prevent, treat, or cure any disease. Read More.